Our house has got a two bedroom apartment: No IV. In the double sleeping room is a third bed and in the single sleeping room is a second bed possible and the living room has got a double sofa bed. Highly recommended is especially the combination of V and VI. Then you can use the whole top floor. Between the two one-room-appartements is a hall area, which can be shared and is closable towards the staircase. Two shower / wc's and two TV's there are offered. In the village part called Blindau you'll find exercise lifts and a snow-tubing track, which certainly makes fun for everybody. The older ones will enjoy the toboggan runs from the Hindenburhhütte to the village or from Nattersbergalm to Seegatterl. Finally you reach the Winklmoos cable railway by car or the free shuttle bus in about 15 minutes. Experience winter fun with your children at the sledding hill in the center, slides are rentable by us for free. The children's skiing school in Reit im Winkl offers courses for children from three years. A sleigh ride through the winter woods will be fun for the whole family. In summer Reit i. Winkl and its surroundings offers much for children of all ages. For little children there is a fabulous walk in the woods, the outdoor pool and children's parties with many attractions in the village. 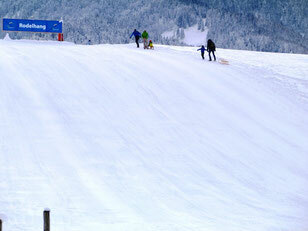 In Marquarstein and Ruhpolding, there are a fairy tale or pleasure park with water playground and toboggan run. The elder ones will enjoy the numerous hiking trails, mountain bike trails, a climbing forest, lakes, the first German climbing path (from the house 5 minutes by feet) or opportunities for rafting, paragliding, horseback riding or playing golf. In a half an hour to an hour's drive, the salt mine in Berchtesgaden, the Holzknechtmuseum in Ruhpolding or the Chiemsee with kings-castle can be reached.